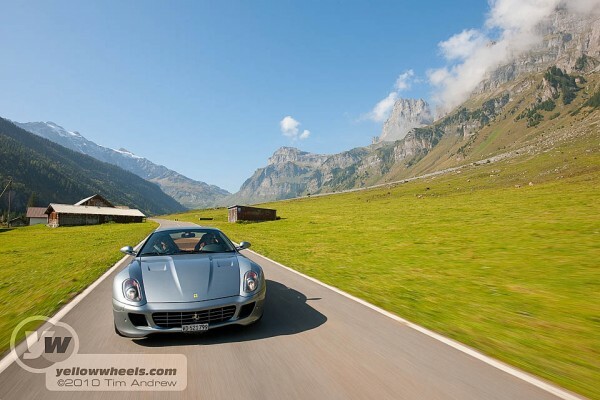 Fancy zapping a few Swiss mountain passes in a Ferrari ? That’s what we did. This is the time of year when winter is wearing thin and you hanker for warmer climes and summer adventures. Planning your annual summer holiday is fun and a sure fire way to lose the winter blues, but it’s months away…. How about a short break, a fillip of sustenance for the soul. 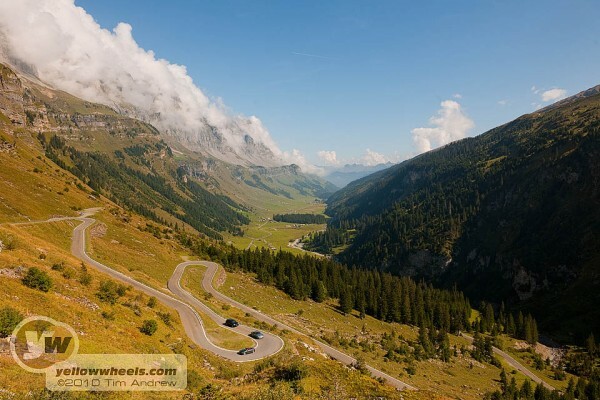 Why not take a driving mini-tour in Switzerland, touring the soaring Alpine peaks and passes. Need transport to match the mountainous magnificence: a Porsche 911 Turbo or Cayenne, a Ferrari F430 or F599GTB, Maserati GT? But where to hire? What about insurance? Where to stay? It’s no problem organising all this yourself online, but think about this: you could easily spend as long surfing, checking airlines, filling in forms, researching routes as your actual short break. This is where Ultimate Drives steps in with prepared itineraries including choice of car to match your budget, routes pre-programmed into your satnav, hotels vetted and booked. If this is starting to sound like an advert, it isn’t, but we have experienced the service first hand. Firstly though a declaration of interest: Our Yellowwheels photographer Tim Andrew was hired for his impeccable automotive and landscape snapper skills. Photos you’ll find in Ultimate Drive’s brochure and website were largely shot by him. So how was the mini-holiday? We have to say that this Ferrari’s satnav is the minimalist variety, including dash-mounted direction arrows, supplemented by voice prompts if wanted, but no map: very disconcerting, very old school! Ultimate Drives’ website though, is loaded with routes and waypoints you can download for your own satnav, although at launch these were only available in the Garmin format. We followed instructions and found ourselves at the base of vertiginous looking mountains. By now traffic had thinned out, and we savoured the prospect of some seriously sinuous streets. The road, initially cobbled, climbed up and through conifer lined inclines dotted with a smattering of chalets. But as the road climbed, our ears popped, and buildings receded. To our surprise, after innumerable switchbacks and breathtaking views of the valley, we emerged onto a plateau: we were only halfway up the mountain. Far from being over, the best part of the drive lay ahead. We had been joined for this trip by Ultimate Drives MD Mark Heather and colleagues, giving us the chance to sample and photograph other cars from their stable. Freshly installed in an Audi TT convertible, we headed along the plateau, roof down, wind in the hair, better for taking in the massive crags that formed a ring around the kilometer wide Urnerboden basin, shaped like a gigantic bath. Think Lord of the rings, or Hannibal’s trek over the Alps and you conjure up the imagery unfolding in front of us. Of course we are heading straight towards the tap end of the “bath” and there’s no valley to funnel into, so presumably the pass must climb up and over what, at this distance, looks like an insurmountable rim. Valley ended, and after a brief stop to look at a huge cliff, which in spring would be a mighty waterfall, (that must be the showerhead ?!) we swop back into the 599. The roads are clear, and we have a chance to howl through the gears. Onwards, and upwards, corner after corner, we weave up the vertiginous end of the valley. But this is not a race circuit, (except that it had been a hillclimb course before all motoracing was banned in Switzerland! ), and respect is due. You’ll find plenty of places to let the car off it’s leash though. At peak holiday times there will be slower sightseers, cyclists and walkers and we don’t want to miss the views by focusing purely on the driving. But even at one of the busiest times on this pass we never encountered the hoards of cyclists and motorhomes that balked us on a recent trip over the Stelvio pass. Summit reached and emotions elated, we pause for a group shot and light traditional cold platter lunch at the welcoming but slightly rudimentary cafe. No unsightly gaudy tourist traps here; in fact nothing much apart from the cafe, shop, car park and the crisp, but thin alpine air. We are at 1,948 m / 6,391 ft, an altitude you would normally only visit during a skiing holiday! After the intoxicating experience of the climb up this, the Klausen pass, the decent isn’t the anticlimax you might expect as the road narrows in parts, weaves along sheer drops, lassoing later down the steep slopes into greener valleys. It also allows you to savour the driving experience now that you are truly used to your car. But beware: overhanging rocks and drops to your left will keep you on edge. Meet a truck on the wrong bend and you will be testing your anti-lock brakes to the full. We are in the Porsche Cayenne now, and the sudden increase in driving position is heightening the tension as we travel down the last sections of the pass. The reassuring armco is no longer at bum height and we get a more frightening view of the bottomless ravine below. A further short stretch south on the impeccable Swiss highways, and we then turn right towards the Susten Pass. Unlike the Klausen that weaves through its valley, the Susten is literally “cut” into the granite walls. An initial ascent through some dense forestation, finds us emerging high on the “walls” of the valley tackling a series of long carefully engineered sweeping curves, before a final tight stretch of switchback turns that take you to the summit at a little over 2,200 m / 7217 ft. The journey back down on the west side of the pass is beautiful, taking you first through a series of tunnels cut through the granite rocks, and under several small waterfalls. Then As you descend further, the valley once again starts to open into lush green terrain and a sweeping viaduct bridge in the depths below us: we are almost back down. If we had been doing the route in the opposite direction we would inevitably have recalled scenes from the original “Italian Job” movie: just hope we don’t meet that bulldozer coming out of the next tunnel! 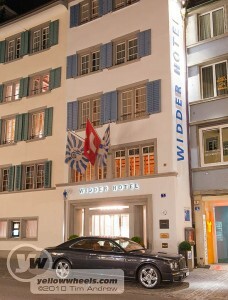 The Alpine antics are nearly over and we just have enough time for a tea stop at the luxurious Victoria Jungfrau hotel. This 5 star establishment is a stop-over option on a longer version of the 4 passes break. But we are on a mission to record as much of the route as possible, and a lakeside photo beckons. The journey back to Zurich sees us going over minor passes compared to the earlier Klausen and Susten, but proves to be entertaining nonetheless as the road empties in the darkness of late evening. So what do we of make of the experience? Result: pure pleasure of driving a fabulous car over some equally spectacular mountains. The only other realistic way of experiencing a supercar over an Alpine pass without owning one, would be to take up a membership of a supercar club. But you would eat up your annual mileage allowance on one of these schemes pretty quickly if you drove all the way to Switzerland. Plus the idea is to cater for short breaks, and the drive there would consume most of your long weekend and energy. The fact you can just arrive and get on with it takes the drudgery out of organising a trip yourself. Caveat: you still have to book your own flights if arriving from abroad – Ultimate Drives say it would be impossible to give a fixed price for the tours if they included the vagaries of air travel pricing. After all, you could be flying first class, or Easyjet, with prices to match. Just get yourself to Zurich, and they do the rest. Look at the prices and you might gasp a little, but remember that you could spend this just on hiring a supercar for the weekend. Ultimate Drives have teamed up with a major car rental company, so that they can draw on the wealth of their prestige and supercar stable. If you had a problem with your car, they have the resources to find you a replacement. These breaks are mostly bought as gifts for partners, corporate incentives or rewards, and as such fit the bill perfectly.